Many of today’s data management and analytics solutions look like connectivity and protocols did in the Smart Systems and IoT space ten years ago — a big mess! These cobbled together offerings fail to provide the functionality and performance required to gain real insight from IoT and Smart Systems data. To address this challenge, tech suppliers, users, and value-adders must adapt new technologies and approaches that are forward-looking and collaborative, rather than mere rehashes of yesterday’s solutions. Because machine and sensor data from these devices tends to be noisy, analog, and high-velocity, there are major challenges that legacy datawarehouse and analytics tools struggle to overcome. This is especially true if you want to integrate streaming sensor data and historical structured data together in near real-time. The volume, velocity and variety of data from an ever-growing number of IoT devices certainly presents a data management challenge, but also a major opportunity. The Harbor Research Smart Systems Forecast Model estimates that 4.8 billion new IoT devices will go online in 2017—driving an estimated $33.1 billion in data management and analytics value this year alone, and growing to a projected $360 billion by 2025 (a compound annual growth rate of 35.1%). Legacy solutions simply will not be able to handle the volumes of data from these devices, and they also lack the analytical capabilities required to produce actionable insights from this data. As companies face demands to work faster and more productively with smaller staffs and tighter budgets, ‘cobbled together’ solutions, which combine a variety of legacy and open-source data management and analytics solutions in a costly and inefficient manner, will not do. Ultimately, a combination of non-integrated legacy and open source solutions cannot effectively function in a world of Smart Systems that is largely driven by the ability to quickly and cost-effectively integrate and analyze diverse data. Today, equipment manufacturers are under pressure to meet new service level agreements (SLAs), provide more personalized, predictive services, and drive additional customer value and growth opportunity. To capitalize on these new data-driven opportunities, we envision select equipment manufacturers, machine builders and IoT platform suppliers emerging as a catalyst for data management and analytics adoption—driving new tools, capabilities and insights into end customer accounts and processes. 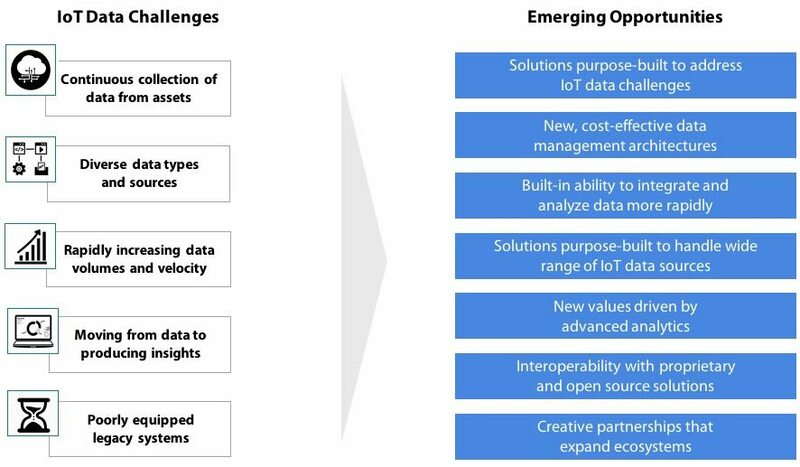 However, an equipment manufacturer or IoT platform provider’s role as a catalyst will only be as effective as the underlying IoT data analytics solutions they are enabled with and the collaborative ecosystems they are able to form. The Vertica Analytics Platform is one such tool that enables customers to address emerging IoT use cases and service delivery capabilities that require new and differentiated data management and analytics capabilities. Vertica enables this by not only managing and analyzing massive volumes of data quickly and cost efficiently, but also by catering to the unique requirements of IoT data.